There were a number of insights, some of them cynical. For example, Haviv Rettig Gur started the ball rolling with a comment on the difficulty that antisemite Linda Sarsour and her friends were having in distancing themselves from Farrakhan -- despite his best efforts to make easy. Weintraub made the required comment that criticizing Israel in and of itself is legitimate. Personally, it is unfortunate that we feel the need to even state this. 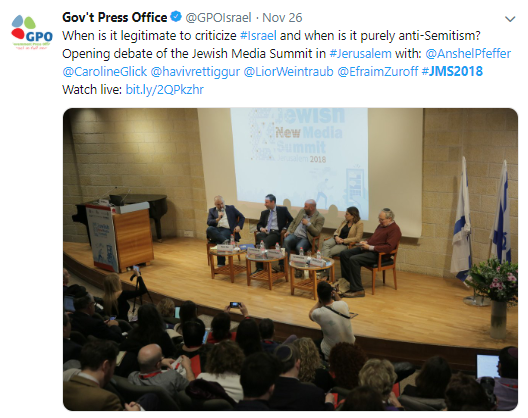 But of course we do, because one of the common tactics antisemites use to fend off accusations of Antisemitism is to claim that the label is being used in order to defend Israel from criticism of any kind. This is the meat of the definition and goes beyond the 3 D's definition of Natan Sharansky, which was not even mentioned during the discussion and perhaps has fallen into disuse despite its brevity. But even the IHRA definition does not address what, if anything, is new about Antisemitism today and how it is different from Jew-hatred in the past. That is where Caroline Glick came into the discussion, saying that hatred of Jews should be seen in terms of the prevalent Gestalt of the time. Glick said that the term 'Antisemitism' itself is antiquated. It goes back to a time when Jew-hatred was based on race. It was a time when the eugenics was considered the height of science and Jews were hated as a people -- as opposed to an early time when Jews were hated as followers of a particular religion. After periods when religion and then race were part of the Gestalt, now we have 'Anti-Zionism' -- a hatred of Jews in an era where globalization and post-nationalism are the influential sentiments. Glick referred to Airbnb, whose boycott of Israel she described as a big blow, and a big smack in the face. Airbnb decides that they cannot rent out a basement in Efrat on land bought lawfully, cannot rent out because they are Jews. That is the very definition of anti-Jewish discrimination. Like Glick, Zuroff also went into how the definition of Antisemitism has changed. Classicly it is based on differences in religion -- a distinction which today is not considered politically correct. Today it has morphed into Anti-Zionism. This he sees as the reason for the difference in reactions to the massacre in Pittsburgh on the one hand and the missile attacks on Gaza on the other. There is an outpouring of support for the former, but not for the latter. This is despite the fact that there are 500 rockets being aimed at civilians. As Zuroff put it: "The world loves defenseless Jews." And when Sarsour claims that some of her best friends are Jews, she means that is because they are the right kind of Jews. As Glick put it, according to the left, there are certain Jews who deserve to be hated. To me, that is reminiscent of Farrakhan's distinction between 'satanic Jews' and 'good Jews' -- as if he had been put in charge of deciding who fits in which category. The problem, as Glick put it, is that for those on the left to take a hard look at progressive Antisemitism is just "too ideologically expensive." At this point, the abstract discussion of Antisemitism turned into a critique of Netanyahu's foreign policy. As opposed to Western Europe, Eastern Europe may hate Jews, but they are beginning to profess a love of Israel. Zuroff was very vocal in his dislike of the overtures Netanyahu has been making to Eastern Europe, where during WWII they were not merely accessories but actively helped the Nazis kill Jews and went so far as to kill Jews on their own initiative. Zuroff criticized Netanyahu for being silent about the past history, instead of using the "Holocaust card". One example he gave was the friendship Netanyahu has extended to Viktor Orban, the far right Prime Minister of Hungary. A Hungarian blogger at the conference described it to me as Netanyahu giving the "kosher seal" to Oran, protecting him from the criticism both in Hungary and in the EU that he is an Antisemite. Here Rettig Gur stepped in and explained the thinking behind Netanyahu's actions. Netanyahu's actions could be an attempt to weaken the EU's hostile strategy against Israel. For example, last December, Hungary abstained when the UN General Assembly overwhelmingly rejected the US recognition of Jerusalem as Israel’s capital. More importantly, Hungary joined with the Czech Republic and Romania to block an EU statement that criticized the US for moving its embassy to Jerusalem. On a final point, Pfeffer differed from the rest of the panel. He was the only one who insisted that Israel was doing a good job in Hasbara and also went so far as to say that the EU was being maligned. It actually makes a lot of sense that Pfeffer would hold such an opinion. According to Pfeffer, Israel is violating international law in terms of the occupation and the settlements. That being the case, he sees eye-to-eye with the EU both in terms of the illegality and in terms of the measures the EU is taking against Israel. Since Pfeffer sides so heavily with the EU, he would see what few successes Israeli hasbara has as a clear measure of success. And of course, Pfeffer was not bothered by the recent decision by Airbnb in the way the rest of the panel was. But at least they all agreed that Antisemitism is a bad thing.